Source provides dimensional and visual inspections (also known as: metrology services, validation, verification, product evaluation, contract inspection and layout inspection). Calipers – There are several different types of calipers designed to measure length, depth, internal, and external dimensions. Calipers can also be used to transfer dimensions from one object to another. 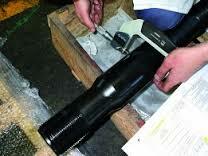 Bore gages – Take an internal diameter measurement or compare to a pre-determined standard. Fixed gages – Used only to compare an object to a standard, fixed gages can measure attributes such as angle, length, radius, bore size, thickness, and other parameters. 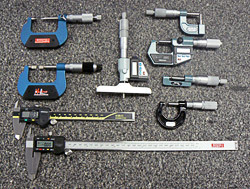 Micrometers – These dimensional inspection hand tools can use mechanical, digital, laser, dial, or scale technology to precisely measure length, depth, thickness, diameter, height, roundness, or bore. Protractors – Measure angles with a variable protractor or compare the angle of an object to a standard with an angle gage. Indicators – The precision movement of a spindle or probe is amplified so the results can be displayed digitally or on a dial or column. 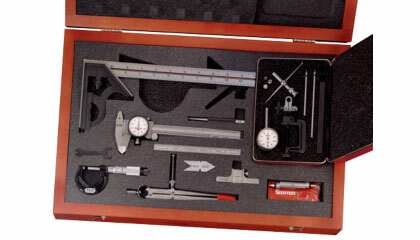 Air metrology instruments – Thickness, depth, diameter, roundness, taper, and bore can be measured by calculating changes in pressure or air flow. Height gages – Electronic or mechanical, these devices are used to measure or compare the length of an object.